"A little OVER all right?" Realizing a surpassing speed range with its efficient trimming system, it’s the new TWIN RS that will convince every tandem pilot. From now on even non-pilots will benefit from the well-proven RAST system which offers an absolutely relaxed starting behaviour to the pilot and an unconditional feeling of being secure in the air to passengers. 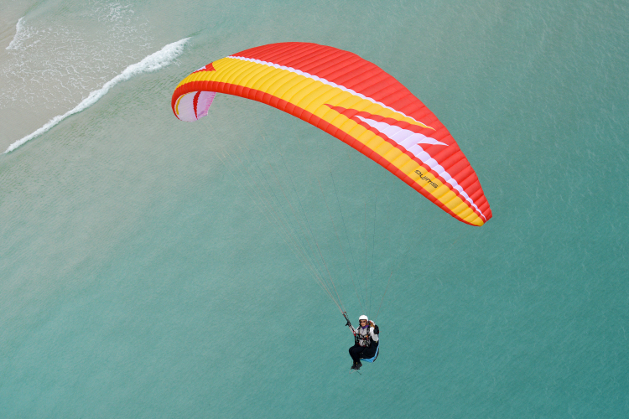 The TWIN RS strikes a completely new path of technical design and flight conditions and keeps details like a fatigue-free big ears system and abrasion-resistant reinforcement on the leading edge that ensures very favorable flying characteristics for amateurs, XC- and professional tandem pilots on the ready. With a take-off weight span from 140 to 225kg the TWIN RS will impress you by its sensational climb rate, handling and extremely high canopy stability! Get more information on the DHV homepage! ... and on the SWING website! The production of the TWIN RS has already been started so that you won’t have to put up with a long delivery time. As we’ve got a great and enthusiastic feedback on the NYOS during several testivals this year, we also heard that many pilots are longing to fly this high-end EN-B glider also in their weight category. Covering a weight range from 100 to 125kg and reaching an incredible speed due to an innovative risers’ system with C-bridge and profile morphing, the best rankings will be open for heavier XC and pleasure pilots!